Lowen Okamoto was born and raised on the island of Maui. 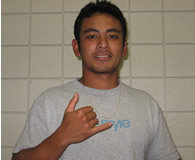 He graduated from Kamehameha High School Maui in 2006. Currently, he is a sophomore at the University of Hawai`i at M?noa in pursuit of a degree in Mechanical Engineering and plans to graduate in 2010. He enjoys surfing, motocross, and listening to music. Standard incandescent and halogen light bulbs have been the practical method of lighting for many years. They provide us with a full spectrum of visible light, which is useful to the human eye. Much of the energy that goes into lighting these bulbs, however, is unseen light given off as heat. The goal of this project was to show that new LED (light-emitting diode) lights save energy and provide a better quality of visible light. The hypothesis that LED lights are much more energy efficient, eliminating ultraviolet and infrared light, was tested. An aperture was built to house different types of light bulbs, to compare the different outputs of light from each source in a spectrophotometer. However, this instrument was made for testing filters, and could not be used for testing different light sources. The project then shifted to the use of a fiber-fed emission spectrometer, which gave a simple layout of the spectrum of light emitted at different wavelengths by a source. Additionally, with a kilowatt load meter and flux measuring light meter, we measured the energy savings and light quality of a variety of light sources including incandescent, halogen, fluorescent and LED. The results from the analysis of various light bulbs will be presented and used to show that LED lights are much more energy efficient and environmentally friendly.